All the ladies out there, don’t you think that pre-stitched sari is a wonderful drape of obvious reasons? But if you belong to the purist category and love to drape and pleat rather than slip in and out, I have two things line up for you. First of all, ask your mother to give you a crash course on draping and if you are a techno freak simply download a useful sari-tying iPhone application. Varieties of the Wedding saree with the different styles. 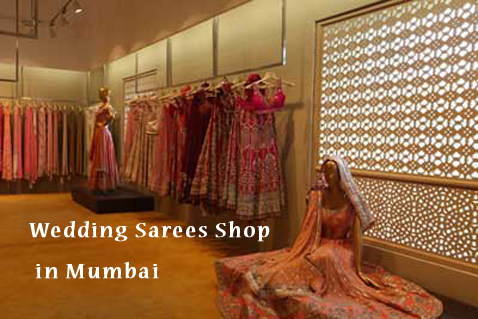 Second of all, follow this guide to the Mumbai’s best wedding saree shops for you to go shopping. Kala Niketan is known for the rich variety it produces. In crunch-infested Mumbai, there are two stores at Marine Line and Juhu occupying over 3,700 square meters. Both the stores are seen lined wall to wall and floor to ceiling, with sarees and salwar kameez materials of all varieties. From Banarasi weaves to south silks, cotton, bandhini and printed to the new fangled embroidered and sequined numbers they have it all in the best of quality. You will find some really busy men behind cloth topped counters unravel, pile, slide and fold saris with the same expression. They might at times break into a smile when a young woman makes a beautiful comment about her blouse design. Price: Start at Rs 500. Two years ago when saree shop Khatri Jamnadas Bechardas celebrated its anniversary, the event could hog much limelight as they had to slam the doors shut because of the unexpected crowd. You might not find fancy mannequins and shiny billboards in the store, but it has such strong word-of-mouth promotion that any Gujarati or Marwari shopper can direct you to the city’s best bandhini saree store. The quality of a bandhini saree is determined by how closely it is tied and therefore it is difficult to put them on display. At Jamnadas, instead of a glass display, the saris are wrapped in cloth bundles so that they retain their wound up pattern for longer. You will find Bandhinis in all colors and materials for all season here. The shop sees a huge rush in weddings and occasions for sarees like the Gharchola (sari with red checks and gold thread) and Panetar (red and white checks). Price: Start at Rs 3,000. Warp n Weft are known for their intricate weaves and traditional motifs. Owner Sagrika Rai shop not only stocks the city’s best Banarasi sarees but she also offers a crash course in weaving techniques. “I’ve been trying to revive old Indian motifs like Shikargah (woven sari with animal and bird imagery),” says Rai. At Warp ‘n’ Weft you won’t find any unnecessary sequins, haphazard zari borders and embroidery on the hand woven sarees. Only intricate weaves with traditional motifs like paisleys, kamal booti and jangla (twine) will be found in her store. Though people in Mumbai often equate Banarasi saris to heavy silk, materials like silk, cotton, tussar and georgette are bought too because of its light weight. “This is what real Banarasi weaves feel like,” says Rai. Price: Start at Rs 2,000 and go up to Rs 100,000 or US$2,000. If you are a kind of person who who’d rather stay within city limits to satiate your desire for South Indian Kanjeevaram silks, the Mumbai Nalli is the best store for you. The store is extended to over three floors but its ground level is the most special of all. The silk saris with gold-colored weaves are found here. The sarees are made of heavy silk and found in colors of bright greens, purples, yellows and pinks. The price varies according to the use of thread which might be artificial, silver dipped in gold or real gold zari. On estimation the price start at about Rs 1,000 and can go up to over Rs 100,000 or US$2,000. The workers at stores are helpful and earnest. They’ll drape the sari on you and then drape it on themselves. But, if you still don’t appear convinced and become tired of choosing, they’ll offer you a cup of their special south Indian filter coffee. Lazaree is one of the affordable saree shops in the Dadar market. If you ask me to pick up one shop for here, it would be almost impossible. For over four decades, the market near Plaza cinema has been taking care of the wardrobes of Dadar’s women. Lazaree, Paaneri and Rangoli Annexe face Roopmilan and Dadar Emporium and store the best quality sarees for all ages. They were originally meant to cater to the middle class Maharashtrian population, but today, curious sari shoppers have been dropping in too. The USP is its affordability. “Original Paithani saris (peacock designs woven on silk) sell for around Rs 200,000 to 300,000 (US$ 3,800-5,700) but we have some for Rs 20,000 to 30,000 (US$383 to 575),” says Harish Patel from Lazaree. Price: Start at Rs 400. Wedding day has no matches to any other day in your life. The bridal lehenga or saree you plan on wearing on the special day is definitely priceless. This is the reason why you need to select your bridal lehenga with utmost precision. It will be a part of your precious history in the future. You can not afford to make mistakes on your wedding day. In India, red is the color for brides. It is expected of the bride to appear in this color on the wedding day. Also, red is the most complimenting color for the bride too. Also, the red and white color combination is also seen in India. Especially south Indian brides wear a red and white bridal saree for their special day. However, there is not strict rule that it has to be plain red, it can be in various shades of red too. Pink, magenta, purple and orange are all part of the bridal color palate for Indian weddings. Today, most brides-to-be are seen in these shades. Colors like blue, green and brown are avoided though there is no taboo against them. Yellow is also worn by brides in some communities too. If your wedding is due this fall and are confused about choosing the bridal lehenga, we have come up with the best bridal designs of 2013 at your service. This lehenga reflects the sense on style of the Mughal Era which is which is on hot platter today. The fish-cut style lehenga is seen to be gaining popularity these days as it makes you fit in like a mermaid’s tail. It directly links you to the ethic Rajputana bride with a few contemporary frills. Post Kareena Kapoor’s wedding, shararas seems to be back in fashion. The hairdo also compliments this awesome outfit. Baby pink is also advocated by most of the brides today, instead of red. If you are marrying inter religion, this gown-like lehenga will be just prefect for your guests to ponder about. Who is not a fan of the grand Kanjeevaram saree traditionally worn by South Indian brides? This lehenga compliments the velvet blouse and do not forget to put on the full arm length mehendi to complete your look. Simplicity and sweetness flows from this lehenga. You need not over do your jewellery too. You will still stand out. Brides are seen in red and golden Banarasi saree in the eastern part of India. If you have the money, I am sure you will never settle for less. Expensive wedding gowns are a fashion trend these days. Almost all people in a wedding gossip about the cost of the wedding gown or simple about its designer label. Check out our Hollywood celebs, their gowns literally cost a fortune. Let me put it this way, you can actually finance a small scale wedding at the cost of some of the famous designer gowns worn by celebs. They are not only costly but also legendary in terms of style. 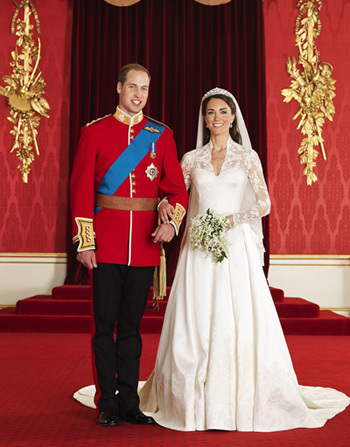 The most recent expensive wedding gowns belong to Kate Middleton. She married Prince William of England in 2011 and became the Duchess of Cambridge. Her designer wedding gown became talk of the town for many days. 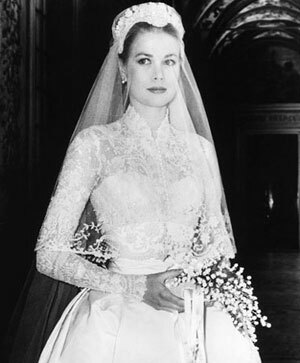 The gown was inspired by Grace Kelly’s wedding dress worn back in 1956. We have come up with more interesting facts about these expensive wedding gowns. Enjoy the list below. Grace Kelly, the famous Hollywood actress married Prince of Monaco, Rainier in 1956. Her dress was designed by Helen Rose, a famous designer of that time. Till today it is considered as one of the loveliest wedding gown ever made. It cost a huge $65,000 sixty years back. Image its cost now! When Jennifer Aniston and Brad Pitt got married, the ceremony hogged the limelight for many days. Jennifer’s Lawrence Steele wedding gown cost a record $50,000 in the year 2000. Now since Anniston is planning on tying the knot again, let see what she is planning on this time. When Victoria and David Beckham tied the knot in 1999, she was wearing a Vera Wang wedding gown that was estimated to be around $1,00,000 at that time. Its cost must have touched skies now. Though the wedding was very short, Kim Kardashian bought 3 Vera Wang wedding gowns for $75,000. It was sad that the wedding could not even last for 2 months. 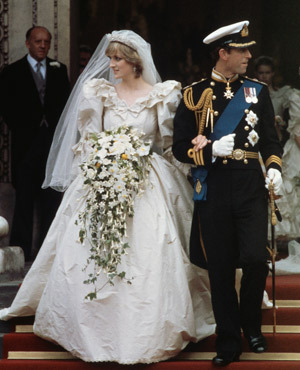 The 19-year-old Lady Diana was seen wearing a David Emanuel gown on her wedding day. The silk and tulle dress was adorned with over ten thousand pearls and cost $43,000 way back then. Its price today will easily be $4,00,000. When Hollywood’s golden couple Michael Douglas and Catherine Zeta Jones got married in 2005, Christian was seen wearing a custom made gown costing a whopping $1,40,000. Katie Holmes, the third bride to Tom Cruise, wore a very pretty Armani gown for their wedding costing her $50,000 in 2005. In Kate Middleton’s royal wedding with Prince William, Kate was seen wearing a custom made Alexander Mcqueen gown inspired by Grace Kelly’s wedding dress costing $4,00,000. 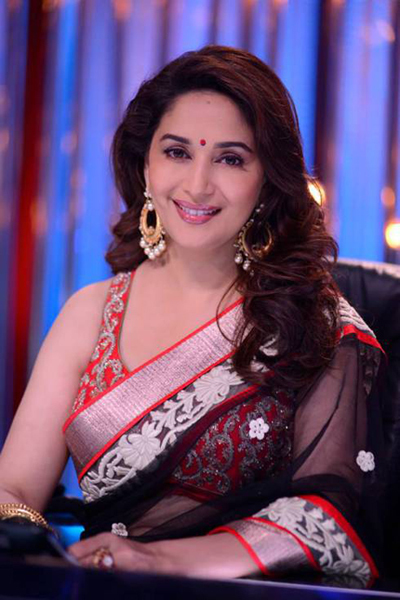 Who could not not stop noticing the ‘Dhak Dhak Girl’ of Bollywood Madhuri Dixit in the season six of the Indian reality show Jhalak Dikhhla Jaa aired by Colors TV. 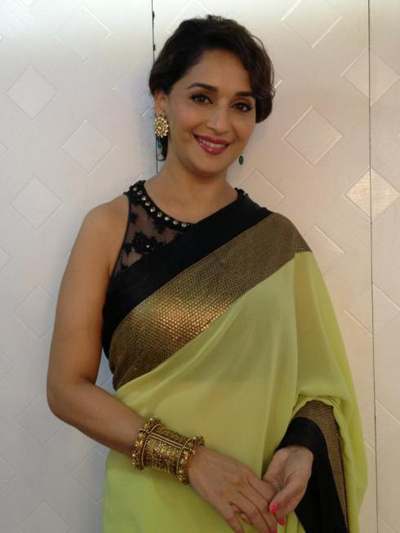 Colors have given Madhuri Dixit-Nene a gorgeous look in the fully Indian attire. She was a judge on the show and has worn some seriously trousseau worthy outfits worth giving a glance. Here are my favorite ones! One can not over look the PERFECT makeup on her with the subtle, natural looking glow. There was nothing over-the-top in her look. She indeed has the charm to carry the right kind of fashion effectively. 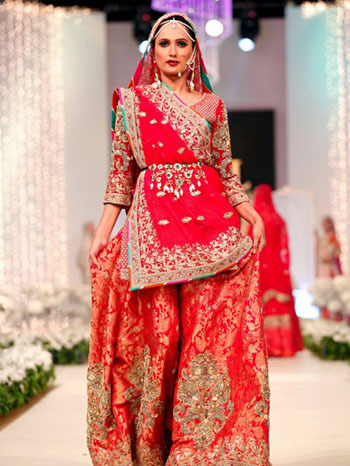 If you are new brides-to-be, the collection of Trousseau is sure to appeal to you. Let me start off with the finale. This Manish Malhotra floor-length anarkali looks simply gorgeous in shades of pink. And where can you wear it? 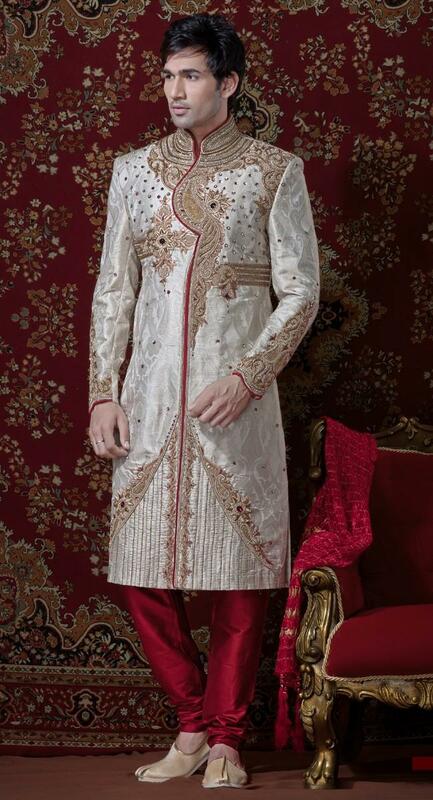 This will be utter prefect for your Sangeet or Reception. You may also consider it for your Engagement if you decide to go heavy. Her fresh-as-a-daisy makeup goes perfectly with the heavy outfit. WOW! Whenever you see the colors red, blue and white together, what does it remind you of? Yes, the American flag. 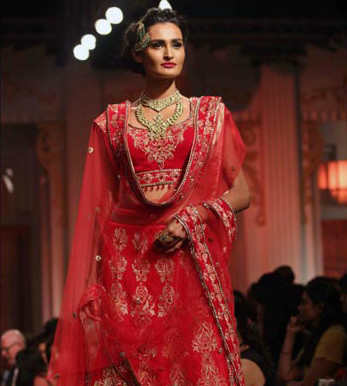 Though, most female do not like this combination, Vikram Phadnis lehenga could stand out from the rest. And the blouse! I could literally hear girls gossiping about it. Where can you wear it? You could wear this to your engagement, or to your friend’s wedding. This Arpita Mehta creation that Madhuri wore on Jhalak would make for a really nice trousseau sari collection in combination to these mirror-work blouses. When can you wear it? To dinner parties, and also pre-wedding cocktail parties. Just as Madhuri did, it is perfectly acceptable to leave your neck bare if your blouse already has so many colors and patterns. 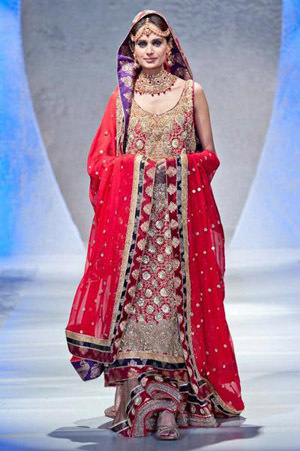 There might be pressure to look like a nayi dulhan, but wouldn’t you much rather look like a stylish newly wed? This combo is just it. This Nikasha sari seems to be in a war of colors. The pink pallu turns yellow at the pleats, wraps around once in orange and then ends in patterned pink and orange pleats. This sari in bright colors with a medium size golden border is sure to make you look elegant. Where to wear it? To your friend’s wedding, or to any formal party. Gajra is made optional. This stunning black net sari by designers at JADE gets a perfect heads up with the heavy red blouse. Where to wear it? Dinner parties, relative engagement or even a Mother of the Bride/Groom sari for small parties. Madhuri looked only a day over 30 in this makeup. Who could ever imagine that the combination of baby pink and black would look this pretty together? Where to wear it? Wrap this around to your close friend/relative’s wedding. It will also look great on the sister of the Bride/Groom! And how about those chunky gold bracelets? AZVA designs are plain awesome. Hence proved! This turquoise blue blouse paired with a pretty orange color will automatically make you fall in love with this Peppermint Diva sari. Where can you wear it? A sari for your trousseau to wear to a friend’s wedding and for Mother of the Bride/Groom. Your mom could even borrow it from you after your wedding. Everyone will simply love it. This is a shower of sophistication and gracefulness blended together. And if you’re getting something similar you may avoid that net panel right underneath the puffed sleeve. Where to wear? Fine for dinner parties and Mother of the Bride/Groom to wear on your Engagement or Reception. This Atsu sari is perfect if you want to add a unique color palette to your trousseau. The pale yellow and black work with a pop of pink nail paint will make you complete as a female. When can you wear it? Wear it to semi-formal or casual outings post-wedding, such as puja or to your friend’s Haldi/Mehendi ceremony. This bright pink and parrot green Arpita Mehta creation will remind you of a parrot which will be another great combination for your collection. 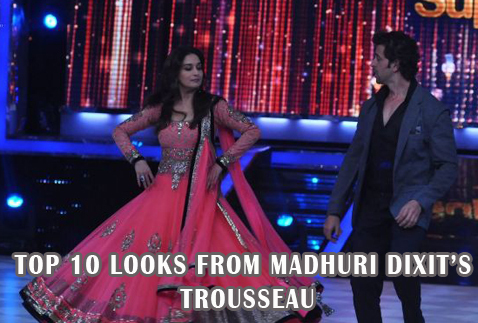 Though this combination is much avoided, Madhuri could carry it perfectly well. The floral blouse provides an added dimension to the outfit. Where to wear? To your friend/relative’s Haldi or Mehendi ceremony, or even your friend’s wedding. Check out those massive gold jhumkis as well! Don’t you think they look pretty darn GORGEOUS! This is the pair of antique silver earrings every woman will go totally crazy for. Even I couldn’t stop staring at them during the show. But I feel that the Shehla Khan sari would have looked more appealing if pared with a better blouse. The accessories were spot on and made me realize you don’t need to wear gold or platinum or diamonds or kundan always. Inexpensive metals too sometimes look WAY better with your Indian wear. So, what are your takes on it? Which Madhuri outfit would you love to have in your wardrobe collection? Leave us your comments below. Are you confused on what to wear for your wedding reception? 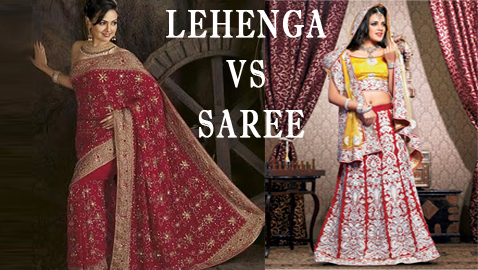 Are you getting a hard time on deciding lehenga or saree? This is a normal confusion for every new bride. So, I thought of help you out today by placing a few of the justification for both of them. What is most important is to have a check on your budget and plan accordingly. Well, if your budget is less than 15K – 20K I would recommend you to go in for a saree, because lehengas below 15K are mostly tacky or over blingy and you will not come out classy. You will instead be able to find a lovely saree within your budget. It is seen in most ladies that they only reuse their lehenga once or twice. And if you are from Maharashtra girls are generally seen dressed in Anarkalis or simple lehengas or sarees. But if you think smartly you will come up with a lot of ways to make use of your Lehenga as much as you could have used your bridal saree. Foe example, you may use the heavy corset of your lehenga on a simple plain skirt or use your heavily embroidered blouse on a plain saree. You may also wear your wedding lehenga with one of your Plain gold/copper/silver blouses to your best friend’s wedding. The heavy dupatta can be teamed up with a contrast plain silk salwar kameez too. Go easy with your makeup/hair/accessories whenever you wear heavy bridal wears. Stick to simple accessories. Trust me, if you buy a heavy bridal saree, you will not wear it often. A Lehenga saree – The combination will keep both you and your family satisfied. Anarkali Lehenga – It can be readily reused a number of times. Take a deep breathe and think for a while, what you really wish to wear instead of asking around and confusing yourself. Marriage is once in a lifetime opportunity and therefore, it just has to be perfect. No if’s! No But’s! All the best with your choice. Rajasthan, the land of desert, is famous for its culture, music, traditions, elegance and beauty. Jodhpuri safa is an important part of the traditional dress of men in Rajasthan. It is very well known as the most colorful turban across India. It reflects the spirit of the people and culture of the region. It is available in various styles and sizes, which vary every 15 miles across the desert region. Turbans are around 10 meters of fabric and can be tied to the head in various styles, with a tail behind and a fan-like crest on the top. They are available in many types of fabrics but cotton is used the most. The Rajput community proudly uses the turbans. In different parts of Rajasthan, the turbans usually represent the climatic conditions or the caste or something else. For example, the color can symbolize a caste and or the position of the person in the society. The color of the turban holds a special meaning as different colors denote different castes. Thus turbans can be found in various colors. Also there are special turbans worn for every festival. Colors also depend on the seasons. During February and March when the crops and the flowers bloom, turbans in white or red can be seen. July is the best time to wear the pancharanga that comes with five colors -red, yellow, green, blue and orange- representing the ground of Rajasthan during the monsoon season. The Jodhpuri Turbans represent honor and respect for a person in India. They are world famous for their amazing styles, designs and colors. Naturally a man dressed in traditional costumes look more elegant and the turban adds to its grace. Thus these turbans are not just used during the festivals, important gatherings or receptions but are also considered essential in the wedding dress. It provides grandeur to the face of the groom. It is decorated with kalgi, a jewel which is placed on the front side of the turban. 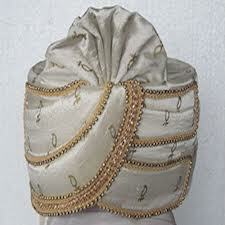 Wedding turbans with kalgi and feather symbolize prestige and royalty. The famous chunari safa (turban) uses Bandhej art to create amazing designs. Usually it is red or yellow in color but it can also be available in other colors. Kesariya safa is saffron which denotes purity and elegance. It is usually worn in the weddings. Pacharanga safa is the most colorful of all the turbans. It is made of 5 colors, red, yellow, green, blue and orange. It can also be used in a technique of tie and dye. Rajputi safa is somewhat round in shape and is a bit smaller than other styles. Jodhpuri safa comes with stripes of various styles and colors which give a look of a wave in the turban. These unique turbans come preformed and tied in a traditional way. Now you can buy this beautiful symbol of elegance and grandeur and add it to your style. Event Management India is the best shop, where you can get the latest and best designs of Jodhpuri turbans and turbans especially for weddings. You also get all types of ethnic costumes for men and women, traditional dress for marriage like the Designer Groom Sherwanis, Kurta Pajama, Designer Suits and Wedding Sherwani, Wedding Sarees, Wedding Lehengas and Jewellery for any occasion. Have a look at our website www.eventmanagementindia.com and buy online. Speaking of traditional outfit among Indians, Kurta pajama leads the way. Its popularity and appeal from time immemorial is due to its high edge comfort and effortlessness in wearing. Kurta pajama is known for its conventional look i.e. • A little embroidery on the neck. As for the pajama, it is loose too with draw string trousers. Western outfits swarm the market today. Guys prefer wearing shorts, tees, and cargos. But, for a comfortable sleep at night a few lot still opt for kurta pajamas. Though its demand has lessen today, it still make its presence felt among guys when situation demands for an ethnic look. So, the market today is still flooded with latest designs with a bit of fusion in the fabrics and embroidery. Different looks are designed for different occasions, like weddings, festivals, parties, get together etc. Also, formal wear are completely different form casual wear. Latest kurtas is made with materials like raw silk, georgette, crepe etc with heavy embroidery not only on the neck but also on the calves of the sleeves as well. To cope up with the budding taste of the youngsters, the conventional kurta pajama has undergone a cosmetic change. Changes are being made in designs and embroidery to suit according to tastes and also to the pajamas. For just a loose draw string trouser style, it is being modified to churidars, western pant style pajama, pathani pajama, Afghani pajama etc. The Event Management India has been trying to enchant the younger generation from time to time by adding designs in vibrant colors, patters, style and work so that they continue the trend and also not feel themselves to be out of fashion. Now-a-days, the set comes with and additional stole to give the wearer a whole new imperial look. If you are looking for Wedding shopping in India. We promise that you will find excellent quality, latest designs and a good price from our listed vendors. Is your wedding day approaching fast? You have been trying on different outfits but always get back to square one? You are not being able to give a final say on anything as nothing is clinking? Since the wedding day will be the most important day of your life, you will be the center of attraction will all eyes hovering over you. Nauseating is quite expected in you. Usually bride’s apparel is given more importance than the groom and is left behind. But now times have changed. Grooms too have stepped into the field and are making their presence felt in a whole different way thus giving a neck to neck competition in terms of looks and charms. What about sherwanis? Did you try considering it? If you are an Indian, sherwani cannot be an alien word to you. It has been an elegant ingredient in our attire world for centuries. Designer sherwanis increasing fame dates back the great Mughal times who further customized and personified them thus giving it a brand name of its own. 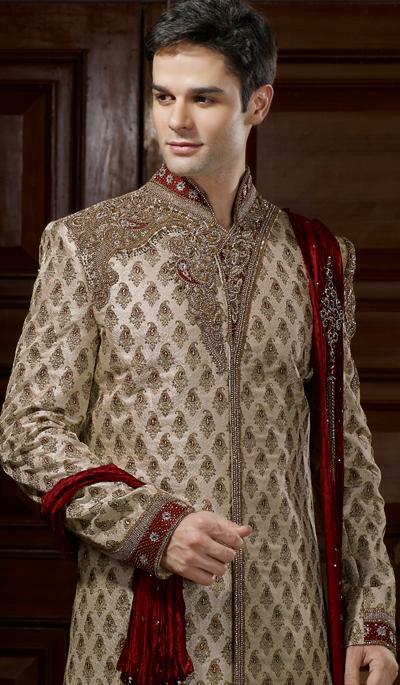 Mens Sherwani without any doubt provides a royal and majestic feel to you looks with a hint of pride and confidence. Talking about Indian wedding, it is all about color, glitz, glamour, alluring apparels and of course the bulk load of customs and traditions. Thus to stand up to excitement wedding attire plays the greatest role at the end of the day and thus should be chosen vigilantly. 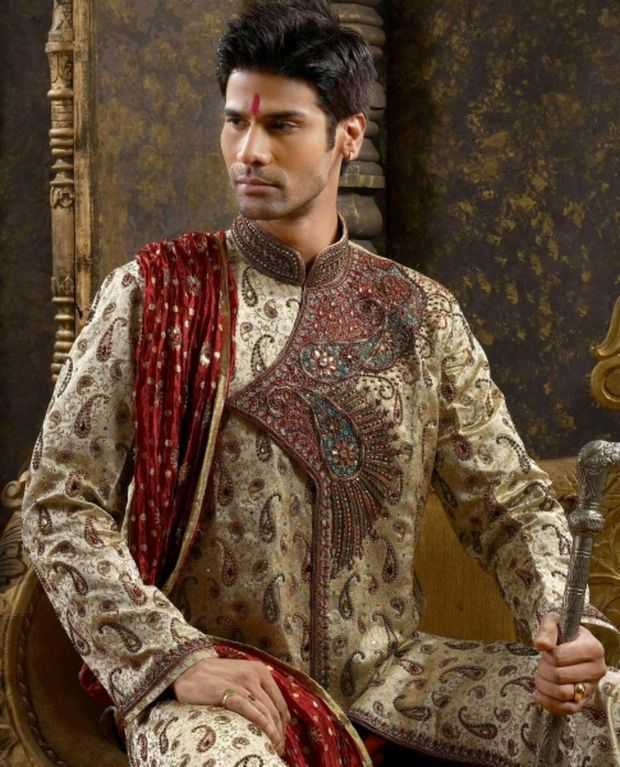 When it comes to providing options in ethnic wear Indian grooms have a excellent list too. Where designer kurta pajama, tuxedos and embellished dhoti kurta top the all time favorites. Each again comes with its own long list of ranges and varieties. Some comes with heavy handmade embroidery while some with embellished beads, real stones, spectacular mirror work and sequins. Thus making you the show’s topper on your wedding day. Jodhpuri is made available in large varieties. You are also provided with a great range of clothing ranging from silk, banni, zardozi, bidri, aari bharat to even cotton. Each of them is so finely that you will get a feeling like the king of the world, be it just for a day! Indian brooms mostly prefer blue, brown, green and off white. Since Indian wedding is all about rituals and customs all day long, in the end it becomes tiresome for the bride and groom to remain loaded with full enthusiasm and excitement with the passing day. What remains finally is the almost heavy dresses, jewelry and yet again the never ending rituals. A less heavy dress at that time comes of handy to quite an extent. Thus, the best part of sherwani – as it is easy to wear, is comfortable and light with no extra burden over the body with an add on smile to save the day. Sherwanis are also available in various varieties. You can choose anyone among contemporary, trendy, casual, designer and a lot others. Discover a perfect shop or boutique which can provide you with latest fashion trends and styles. Choose the one which serves you best and suits you most. Don’t go for fashion statements here as it is your day and you have full freedom to wear what you want! You are given various options of sherwan’s too with contemporary, trendy, casual and designer topping the list. Shop from the best boutique that will provide you with latest trends. Choose the one which makes your face hold a smile of elegance. Its your day after all. You have the right to be choosy, picky and finally stunning!